Please answer my queries too! Where is your palm prints? Post the front side prints and also the side portion below the smallest finger. aarohi wrote: Please answer my queries too! I have posted them above! aarohi wrote: I have attached side palm prints of my right hand (Active hand). I hope they are clear enough. First of all I do not see an fork. Only the slanting downwards of the relationship line. Secondly you have posted your palm print so that I can only see from the side. You have to post is vertical so that I can see the full palm from top to bottom from the front. yes, I will post a picture from front as well. But my main question is whether it is a fork or a branch. Sir, please look closely, the line slanting downwards is my longest line, just where it starts there is an offshoot. It is not a fork . I cant see sharp image but it seems not a fork rather a second line. aarohi wrote: yes, I will post a picture from front as well. But my main question is whether it is a fork or a branch. I have predicted love marriages quite often very successfully. A small vertical line on the Line of heart from below the Saturn Finger going in the direction of the Saturn Finger is indicative of Love Marriage. Another indication, which is possible but not always correct, is an independent head line and if combined with this fingers are short and add to this an angle of over 90 degrees of thumb from the index finger then chances of love marriage increase. In hundreds of cases love marriages that I predicted only two I found to be couples who fought with their parents and separated from marriage. All other indications were where the boy or the girl chose her/his partner and took the permission of their parents and this resulted in marriage. Off course this experience is with all Indian boys/girls. Rest all are in the category of Arranged Marriage. i somehow have these signs present in my right hand;but i doubt love marriage;what do you suggest??? You are studying palmistry books or learning from forums/internet. Have you practise of reading palms? Do it. Read daily 5/6 palms and within 2/3 months time you will get your confidence. The first three points you raised are not valid for Love marriage as I have see people with arranged marriage having them. The other two points: marriage line starting from the back of the hand with the fork or the marriage line starting from the back of the hand ending in a fork? The first one I have not observed to be valid for love marriage and shall keep in mind. Have you any logical reasoning for this point? The second one is heart line joining the sun line -- it cannot be heart line joining the sun line but the branch of heart line joining the sun line. I will keep that in mind and see if I had many confirmations for that. I think you want confirmations from us that these signs indicate love marriage and then you will have love marriage? Is that so? Then you are going in the wrong direction. Listen to your heart. It will guide you much better. Go about your life naturally and you will led to the right result that is in your fate. Leave it to HIM to take care for just at the right moment you will come across your soulmate. There are so many people who do not believe in palmistry/astrology etc.etc. similar science and still get married love or arranged. How do they do? Just observe them and you will know when you leave it to HIM things work out much better. hello sir i have been reading books or articles available online and watching youtube videos by shwetank johri(he's good)...and yes i am practicing as well to build up my confidence...i am slightly weak in terms of mounts.the 5 points that i raised have got nothing to do with my personal confirmations of love marriage ....what you mentioned regarding arrange marriage inspite of having the 1st 3 signs is what confused me when i looked at other people's palms hence, i wanted clarifications on the same. thanks for the help i will definately keep that in mind. There are two lines starting from the Heart line but they curve away and are not totally straight so cannot be sure of Love Marriage. Are you male or female and how old are you? Sorry it is difficult to help not knowing these things. The fingers can depict different meanings for different sexes. ok so for predicting love marriage hearltine should be seen. What about line coming from moon and cutting fate line. My confusion is about marriage line too. Sari wrote: Are you male or female and how old are you? Sorry it is difficult to help not knowing these things. The fingers can depict different meanings for different sexes. This is a hand of female 32 years old. I am learning palmistry and this hand is of one of my friend who is going through tremendous tension at family life and professional life. I m bit confused about her palm as i see lots of lines criss crossing each other. How to see fingers for different sexes. I am not aware about it. As an example a strong or long index finger on a female would show that she is headstrong, as long as other signs agree, it would give her independence and drive, so basically she won't let others bully her. She has quite a strong index finger, but her right hand life line is tied to head line, left is not, which means she wants to make up her own mind about things but feels she is tied to family or is insecure. Sari wrote: As an example a strong or long index finger on a female would show that she is headstrong, as long as other signs agree, it would give her independence and drive, so basically she won't let others bully her. She has quite a strong index finger, but her right hand life line is tied to head line, left is not, which means she wants to make up her own mind about things but feels she is tied to family or is insecure. As I know her personally, I can tell u that its true. She is so very family oriented and bent too much but also highly educated. But can not utilise her education in good manner. about being insecure is very true. Thats something new I learned about fingers and yes headline is not independent in both the hands. I have questions about her sun lines and fate lines too. there is no single sun line rather so many small lines and so many obstacle lines too. There is island on headline showing current period of her life. and fate line also break at the age about 27-28 years. The marital problems are also there. I am real looking concrete methods of identifying the Native`s marrige will be love one or arranged one and i will be greatfull if u can tell is it possible to identify the girls birth place distance ,will be within the realtion or out of the realtives. mount of Jupiter. also the mount of Venus should be well developed.Heart line reaching the apex of mount of jupiter or Saturn , generally indicates a Love marriage.However , in my opinion ,this can't be generalised and u have to show the Photo of the Palm(both palms). https://i.servimg.com/u/f38/19/10/36/16/20150113.jpg im 23 yrs old woman. 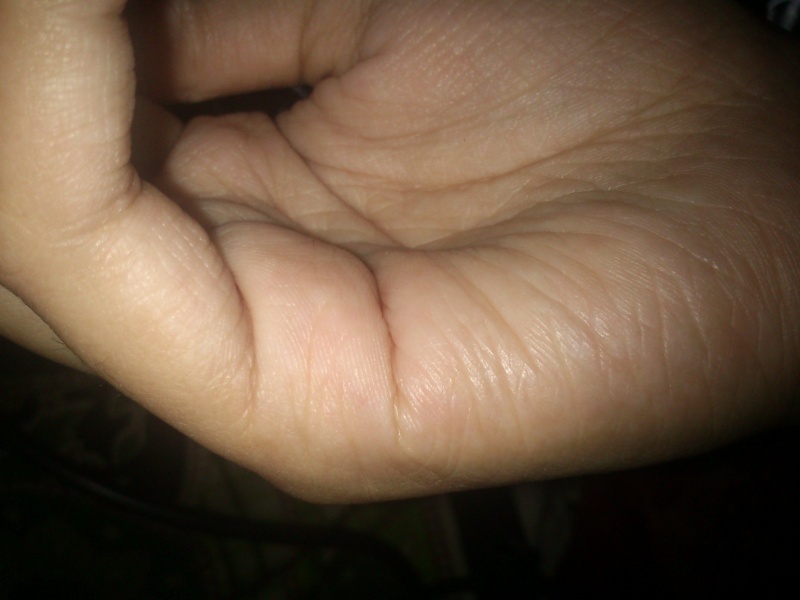 attached here are pictures of RIGHT PALM..pls comment on line under saturn finger. 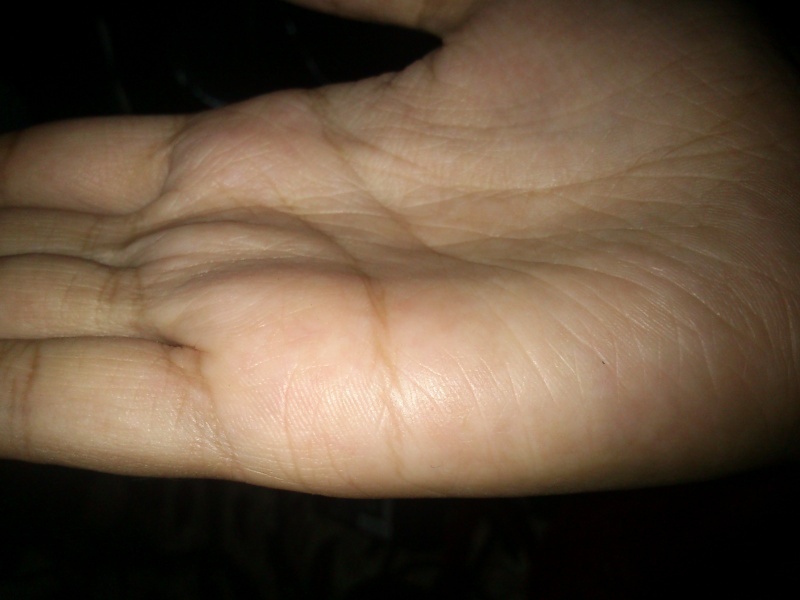 maham wrote: attached here are pictures of RIGHT PALM..pls comment on line under saturn finger. The common concept for predicating marriage is to see marriage line heart line . But marriage line quality is also seen to predict quality of marriage . I see the marriage will little late for you since the pictures are in bits and pieces so to tell correctly I need complete hand image and your age . is it going to be love or arrange marriage?